Phishing – Phishing is a scam where a taxpayer stumbles on an email or website disguised as IRS asking for personal information. IRS will not contact a taxpayer via email or fax. IRS communicates through mail only. Phone Scams – In phone scams taxpayers receive phone calls from con artists who pretend to be the IRS and threaten the taxpayer with police arrest, deportation, and license revocation, among other things if they don’t follow through with the demands of the con artists. Identity Theft – IRS works with the Security Summit partnership of state tax agencies and the tax industry to detect tax return identity theft. Criminals file fraudulent tax returns using someone else’s social security number. Return Preparer Fraud – There are dishonest tax preparers who scam clients by committing refund fraud and identity theft. Inflated Refund Claims – Dishonest tax preparers promise larger tax refunds than their competitors. These prepaperers ask clients to sign a blank return, and charge fees based on a percentage of the inflated refund promised. Falsifying Income to Claim Credits – Taxpayers are unknowingly convinced by con artists to falsify income to qualify for tax credits. It is the responsibility of the taxpayer to file accurate tax returns. 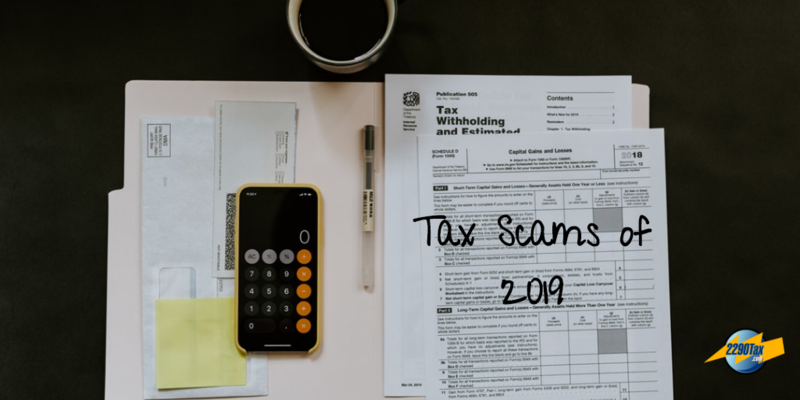 Falsely Padding Deductions on Returns – Overstating deductions, such as charitable contributions and business expenses, or improperly claiming credits, to pay less than what they owe or to receive lager refunds. Fake Charities – Organizations claiming to be charities solicit donations from unsuspecting contributors. IRS suggests taxpayers check out the status of charitable organizations on IRS.gov. Excessive Claims for Business Credits – The fuel tax credit is generally not available to most taxpayers. Farming or off-highway business use are qualifying factors to use the fuel tax credit. Improper claims often involve failures to participate in or substantiate qualified research activities or satisfy the requirements related to qualified research expenses. Offshore Tax Avoidance – This scam involves an attempt to hide money and income offshore to avoid paying taxes. Frivolous Tax Arguments – Taxpayers involved in this scheme make unreasonable and outlandish claims about the legality of paying taxes. The penalty for filing a frivolous tax return is $5,000. Abusive Tax Shelters – Trusts and syndicated conservation easements are sometimes used to avoid paying taxes. Tax moves that sound too good to be true, probably are. Remember it is the responsibility of the taxpayer to file accurate tax returns. Be weary of all things on your tax returns and avoid being caught in a tax scam.